A few months ago I wrote a starter’s guide for those interested in the wonderful, portable world of podcasts. Today we revisit that fertile field, where dozens of shows live and die by the day, to bring you half a dozen more shows that are worth your time post-haste. Whether you’re already up to date on the last set or just looking for a new set of options (that you’re sure is going to last more than three episodes), I think I’ve got something for you here. But, I mean, you’re already listening to Night Vale, right? The comedy subschool of “saying increasingly awful and absurd things with complete poe-faced sincerity” is a personal favorite of mine, and so it was with unmitigated delight that I stumbled upon this little gem. The three hosts – Jim Sterling, Conrad Zimmerman, and Caitlin Cooke – bounce off of each other effortlessly, allowing the absurdity of the bits to grow and heighten to the point of feeling as well paced and coherent as a scripted piece (I suspect the show’s excellent editing helps with this as well), and the show falls almost instantly into a clear idea of what it wants to be, neatly side-stepping the early onset hiccups of a lot of pseudo-narrative podcasts. 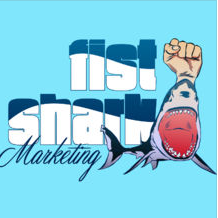 The content itself follows a loose set of continuity around the offices of Fist Shark Marketing (including the recent infestation of prophesied chickens and poor, abused Craig the intern) and their clients, with the three hosts playing character-versions of themselves as the company’s execs. Each episode dips in and out of the real world in so much as it borrows the names of celebrities and occasional weird real-life marketing stunt (like the phallic Play-Doh sets or “McMass”), and then proceeds to make up extravagant falsehoods using those concepts – such as Ron Perlman’s desire to become a human tricycle or Miley Cyrus becoming convinced she’s been possessed by ghosts in her recording studio. At its outer levels of oddity the company comes across almost as a demented cross of StrexCorp and Wolfram & Hart as run by a trio of Mr. Burnses, cheerfully discussing the Satanists living in the building basement or how to spin a vaccine product that causes diabetes as a weight loss solution while bemoaning their ungrateful intern Craig, who won’t even cut off his head to make a decent Headless Horseman costume for the Halloween party. It is a magnificent little oddity, and you’re missing out in not hearing it posthaste. 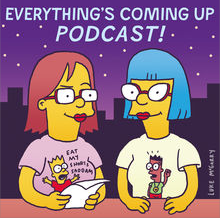 Now, I can already sense some of you shrugging your shoulders and saying, “but I’m indifferent at best to The Simpsons, why would I bother with a podcast focused on it and hosted by two superfans?” To which I say, come back here and sit down. It’s story time. Yours truly, y’see, watched a fair amount of Simpsons with my siblings as a very small child (we’re talking under six here, so my memories are warm but foggy), but fell away from it as they moved out, since they were basically my ticket to getting away with watching the thing in an overprotective-tv household. So the show was relegated to a fond memories type thing, something I’d happily watch with others but never thought to actively seek out on my own (as opposed to Futurama, of which I have seen every episode at least twice). And thanks to this podcast (and the mindblowing discovery of Simpsons World) I’ve been marathoning the Golden Age like nobody’s business. 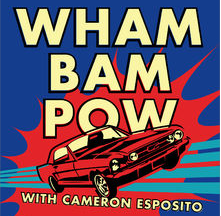 Listening to this podcast it’s almost impossible not to feel affection, even if only affection by proxy, for the show. Hosts Allie Goertz and Julia Prescott speak with smart, impassioned love for The Simpsons – from its impact on their own lives to the way it’s shaped the sensibilities of the modern generation of comedy to its place in history and even just how much they loved this or that little throwaway joke, inviting their guests to build on that rock solid base while also letting the conversation expand into using the show as a gateway to getting to know each new speaker. It’s a solid technique for a guest-based show, inviting fans of whoever’s visiting to come to hear their favored writer or actor and then more than likely ensnaring them based on Allie and Julia’s solid rapport with the source material and with each other. If you are like me, a nerd whose friends over the course of life have been rather less or differently nerdy than you, you may have a nebulous awareness of D&D without ever having had the opportunity to play it. For you, and for people who play tabletop games, and those who enjoy comedic adventure stories, I bring you this podcast. All four hosts (Justin, cohost of Sawbones; Travis, cohost of Bunker Buddies; Griffin, cohost on their advice podcast My Brother, My Brother, and Me) are old hands at podcasting, while their dad spent quite a few years as a radio professional. 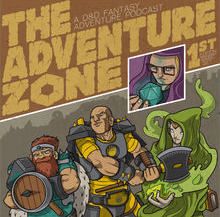 That sets the show on solid technical grounds, meaning that while their fumbling unfamiliarity with D&D is a sort of ongoing joke (DM Griffin is the only one who’s played before) the prowess of the overall execution keeps the jokes intact without the actual podcast feeling choppy or amateur. As for the whole “non-D&D fans play D&D” angle, fans of tabletop gaming need not worry that the show exists to poke fun at the hobby. As much as they jab at each other the players are all taking the stakes of the game before them seriously, and there’s an honest-to-God plot that’s pretty engrossing to follow around all the jokes. It hits a nice sweet spot between being accessible, not taking itself overly seriously, and still feeling like a worthy investment from week to week – sure, there might be an entire town populated by clones of Tom Bodett and the team’s wizard is a ditzy kleptomaniac jerk, but there’s also genuine tension when someone’s health falls down to one. I believe I’ve previously mentioned my love for games journalist and podcaster Laura Kate, a calm and thoughtful voice of reason who’s also quite capable of sparks of great, incisive commentary and good jokes. It’s nearly always true that the folks she picks as her cohosts are likewise well-spoken and engaging, and this podcast is no exception. It’s a pretty great concept as well – common lore has it that most Steam users have far more games in their libraries than they’ve ever actually gotten around to playing thanks to the service’s rather legendary sales and opportunities like the Humble Bundle. 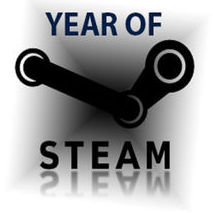 Having three people sift through their collections not only serves to notify other Steam users who might’ve snapped those same games up in the past without thinking what they’re missing (or should avoid) in their libraries but works well as a general review or recommendation format too, since the three hosts generally speak in strong, broad strokes about their playing experiences rather than in-depth spoiler-centric discussions. The content covers a range from indie to AAA, and while each game is considered on its own merits there’s just enough familiarity with the industry and publication histories to feel like more informed consumer than blind taste test. Segmented shows are rarely my thing, since I tend to prefer the long-form conversation that podcasts are so good at enabling, but WBP’s stylish, slickly produced style fits excellently with its choice of content. All three hosts are writers and comics (one being required for the other and all) but not particularly critics-by-job, lending the show’s conversations a unique air of being smart and punchy while also straying more toward a general tone of informality. That’s not to say Cameron, Rhea, and Ricky don’t know their films well – Ricky particularly has an eye for structure of shots and other technical merits – but the overall effect feels accessible to a casual viewer, introducing more complex topics of criticism without losing the sort of big-picture gut focus that the action genre particularly loves to play to. Even when I disagree wholeheartedly with the review consensus on a given film (which is about a 50/50 shot), the conversations always feel rewarding, well explained, and worth listening to. And honestly, it is really, really nice to hear underrepresented voices loving and claiming genres that are thought of as the domain of the “normal” (ugh) movie-going population.